The L'Amour saddle oxford shoes in leather are a true classic. 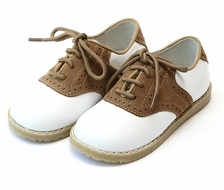 This black and white shoe is a dressy addition to any little boy's wardrobe, and is especially perfect for formal occasions like weddings and graduation parties. The rubber sole is non-slip, so the L'Amour saddle shoes are comfortable for dancing or walking around a party.